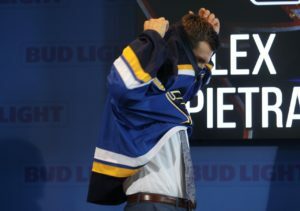 The Blues officially introduced Alex Pietrangelo as the club’s new captain during a press conference Thursday afternoon at Scottrade Center. The 26-year-old native of King City, Ontario becomes the 21st player to wear the ‘C’ on the front of the Blues jersey. The decision comes less than two months after David Backes left for the Boston Bruins. where Backes had served as the Blues’ captain for five seasons from 2011-16. The Blues also announced that Alexander Steen, Paul Stastny, Vladimir Tarasenko and Kevin Shattenkirk will serve as assistant captains for the 2016-17 season, rounding out a leadership group that took this team to the Western Conference Final. Usually a team will assign two other players as assistants. It may have been done before, but having four who will wear the “A” on the sweater may be the first. This isn’t about Pietrangelo’s lack of ability to be a leader. I believe this is more of a move by GM Doug Armstrong and Coach Ken Hitchcock to hold veteran players accountable as they look to become the first team to win a Stanley Cup in St. Louis.